The trend for vintage village fete or ‘tea party’ wedding themes continues to be hugely popular in 2014 – think rustic country gardens, barns and farm venues, hay bales, trestle tables, coconut shies, tombolas, jam-jars, cake-making competitions and cupcakes. Dream of long summer days with a hog roast in the evening or boho festival-chic styling for a chilled summer vibe. So what better way to announce your village fete theme than to bring out the flags with some great bunting wedding invitations and on-the day vintage chic? We’ve brought together some ideas from our favourite designers but you can get creative yourself and design your own rustic invitations. Take a look at our choice below and start imagining those dreamy summer days…. ‘Summer Bunting’ is available to buy in our shop and is available in a wide range of colours to suite your summer fete colour theme. Lovely vintage fonts are used with a pretty bunting motif to produce a beautiful collection of wedding stationery, from invitations to order of service, place cards, table numbers and table seating plans. All you need for the perfect rustic, summer fete wedding! 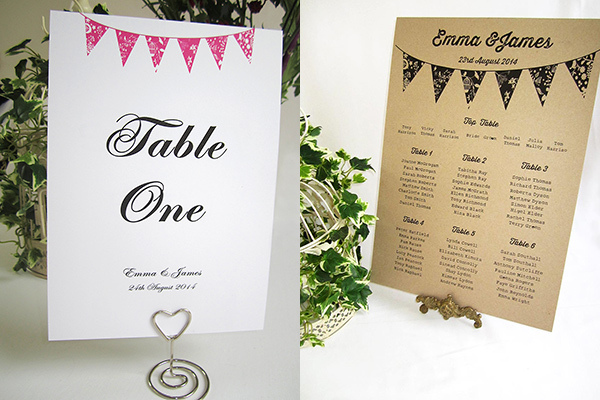 The ‘Portobello’ pocketfold by Little Angel Weddings has a similar theme to the ‘Summer bunting’ suite , incorporating the pretty bunting motif and summer flowers with lovely rustic fonts on a white laid pocketfold card for a lovely rustic feel. Also available in kraft card if you would like more of a rustic, country feel. ‘Must be Fete’ by To Have To Hold is a beautiful, shabby chic wedding invitation which embraces the country fete theme perfectly. Choose between the handcrafted finish with handmade bunting or the print-only design. Made from recycled card and envelopes, the design is eco friendly and is available in different styles formats from flat cards to gate folds and pocket invites. Tailor made on the day stationery is also available – think picnic basket tags, food flags and order of the day fans! Buy this design now in our invitation shop now! ‘Summer Fair’ by Something New is a pretty design printed on 100% recycled ‘Eco-Natural’ card. Featured here in ‘Candy Pink’ & ‘Mango’, all colours, envelopes and twine can be changed to suit your colour scheme. Invitations are available from £2.00. We just LOVE this idea from Postman’s Knock – this invitation set is printed directly onto fabric-backed paper bunting flags. Each invite can include the invitation, gift list, detachable RSVP and info, all packed together in a bespoke, flag-shaped envelope. The whole invitation set serves as a wonderful souvenir of your wedding day and is the perfect way to announce your rustic wedding theme! This lovely printed design comes from the ‘Save the Pennies’ range by our very own Xoxo Wedding. Chose from postcard, Z-folded or pocketfold invitation designs. 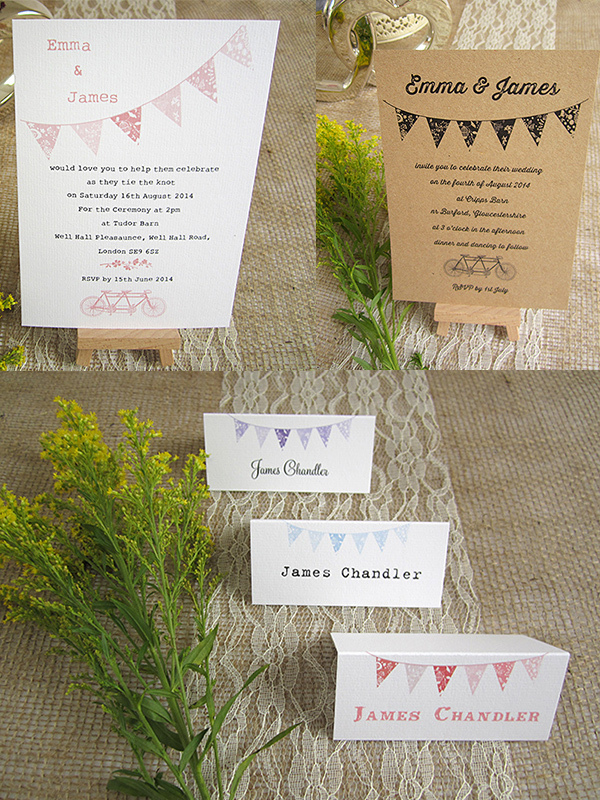 Starting at only £1.40 this is a great way to add a bit of bunting to your wedding announcement! Order this design from our invitation shop now! We just love this beautiful ‘Country Bunting’ wedding stationery collection from Paper Grace, particularly the LOVE sign hanging from the bunting! Country bunting collection is printed onto natural off white 320gsm card, which is 100% recycled and is luxuriously thick with a lovely textured feel. Day/evening invitations from £2.75. Simple but effective bunting design from Paper Happy printed on 250gsm card – also available in Letterpress. This beautiful letterpress design by Blush Publishing was designed by the bride herself. Shelley took inspiration from vintage pattern and summer themes. Her drawings were scanned into the computer and edited in Photoshop. Then she added old typewriter and carnival style fonts into the mix and came up with a design full of nostalgia. The design was then letterpress printed in three colours onto 638gsm pure cotton board. A pretty, printed design by Big Tree Stationery with invites from £1.70 and available in a range of colours. There is nothing quite like receiving a letterpress wedding invitation with its wonderful, tactile finish. I’ve always wondered why Letterpress wedding stationery has not been as popular here in the UK compared to the US, where the old printing technique is certainly one of the most popular wedding invitation styles. Recently though I’ve noticed quite a marked increase in the number of companies offering this beautiful, high quality printing. The Letter Press of Cirencester is certainly not new to the market, they have been printing superb quality letterpress wedding stationery since 1986 and the quality of their products really does need to be seen to be believed. The Wedding Invitation Shop is very proud to work along side the Letter Press and we are able to offer bridal couples a 10% discount on the entire range of beautiful stationery. They offer a full service, covering engagement announcements,wedding and evening invitations, reply cards, orders of service, menus, place cards and thank you cards. Their service is individual. The designs are based on simple classical styles, which you can either adopt as they are, or use as a starting point for your own designs. They are able to add or adapt any of the features shown on the website: plate sinking, using decorative motifs, borders or ribbons, different ink or typefaces. These can all be mixed and matched to create a special look, unique to your wedding. ‘Canonbury’ by Little Angel Weddings is a wonderfully romantic gatefold design, with luxurious satin ribbon and elegant monogram initials. You can find all of the invitation details on an insert card which is studded with diamantes. The wedding invitation is DL size (100x210mm) and available in smooth, laid or pearlescent card in white, off white or creme (shown here in pearlescent cream.) You can also choose from a wide range of ribbon colours. The invitation slips easily into the gatefold card – additional cards can be added such as guest details, maps and RSVP card. The wedding invitation includes an unlined envelope in white, cream or pearlescent ivory but you can choose to have the envelopes lined for a small additional cost for added luxury! The ribbon will be tied for you, you simply slip out the insert card to write names. Wonderfully romantic! The main wedding invitation is £3.45. The full suite of wedding stationery is available including save the date cards, order of service, menus, place card, table plans etc. For more details or to order a sample contact www.littleangelweddings.com – email: info@littleangelweddings.com Samples are charged at £3.45 plus 95p P&P but the cost is redeemed if an order is placed.